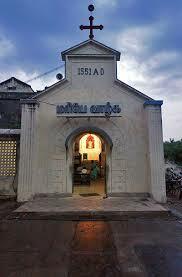 Near Guindy, Chennai, South India, is the hilltop church famously known after St. Thomas, but actually dedicated to Holy Mary. 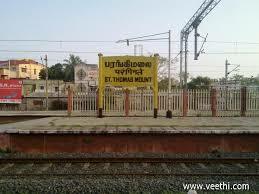 The hillock itself is named after St.Thomas and the nearby railway station is called St.Thomas Mount Railway Station. A special stone cross was found during the excavation for the church, which is preserved in this church to this day. The cross is said to have bled publicly from the year 1558 to 1704 on occasions. The ancient inscription seen here is said to translate as “Through the Cross, the Messiah brought salvation to the world”. The design of this bleeding cross is the symbol of St. Thomas Christians, otherwise called as Mar Thoma Sleeba. 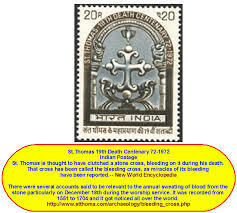 A Government of India postage stamp was released in 1972 to commemorate the martyrdom of St. Thomas and it is shown in the picture here. 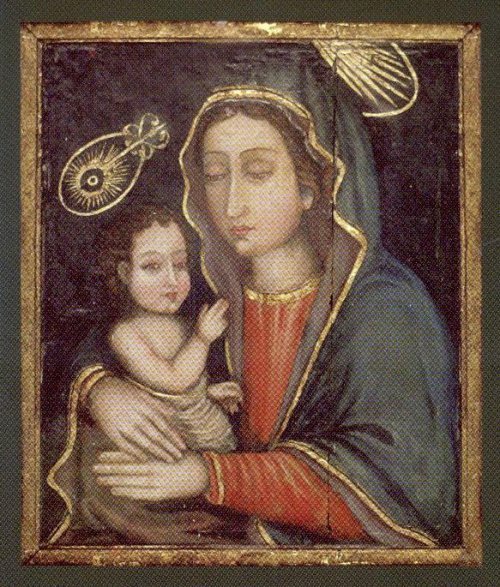 Here is another artifact, an ancient oil painting of Madonna with baby Jesus, believed to have been painted by St. Luke and brought here by St.Thomas himself. A relic of a piece of bone, said to be of St.Thomas, is on display in a monstrance on the wall in the church. Many miracles have been reported to have occurred with the efficacy of the cross, the painting and the relic. The church was dedicated to ‘Our Lady of Expectation’ in 1523. The Church is Roman Catholic. In 2011, the then Pope Benedict XVI declared it as a National Shrine. The website of the church contains lots of other information that you may look up by clicking this link. You may read more details about the mount and the folklore in this New World Encyclopedia article. And lastly, this is the author’s view. I read that the scientific dating of the cross has placed its engraving around the 7th century. Hence much of the folklore may be just that – folklore. On a personal note, this was my favorite picnic spot in Chennai during the days I was a student at the Indian Institute of Technology many years ago. I could go all the way up the hill on my motorbike, although I have trodden the seemingly endless flight of stairs many times for fun. It used to be a calm and serene place overlooking the big city of Chennai. Next Next post: 10 Seconds to Stardom, Israel’s greatest King!